Mumbai City FC face Atletico de Kolkata in the match 52 of Indian Super League at the DY Patil Stadium in Navi Mumbai on Sunday. Mumbai City managed just 12 points from as many matches and are virtually out of reckoning for a semi-final berth. Mumbai City will now need to win all their remaining two matches and also hope that the results of other matches go their way to have any chance for an unlikely qualification. Delhi Dynamos’s Saturday’s win over FC Pune City keeps everybody theoretically in contention for a semi-final slot and Mumbai City will hope to keep their hopes alive with a win. Atletico de Kolkata have just one win from their last eight matches that have moved them down to the third spot with 18 point from 12 matches. Kolkata need only one win from their remaining two matches to qualify for the Semifinals. Injuries to their key players like Freddie Ljungberg, André Moritz and Nicolas Anelka have not helped Mumbai’s cause. Andre Moritz sustained a hamstring injury against Chennaiyin FC in their last home game and is struggling to be fit for the match. Nicolas Anelka has skipped the last three marches with a groin complaint and remains doubtful for this penultimate match. Ljungberg has been the team’s biggest disappointment in their inaugural season campaign with the Swedish midfielder looking visibly unfit picking up niggling injuries to be out of action for the better part of the tournament. However, there is a chance that Nicolas Anelka could feature in today’s match. 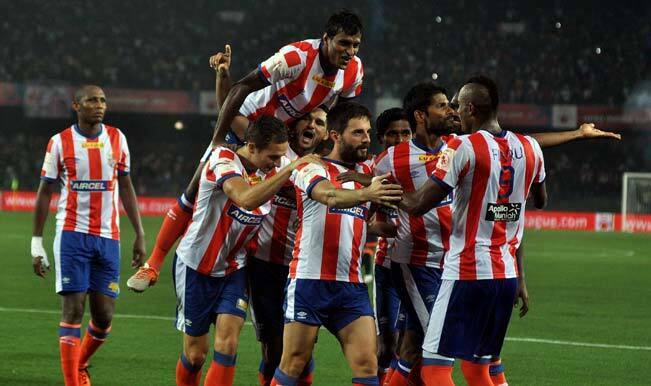 Atletico de Kolkata would be eyeing a win to seal a spot in the semiinals. After being table toppers in the league the Kolkata side has slipped to the third spot but a win against Mumbai will assure them a berth in the play-offs. Kolkata would be without the services of Spanish midfielder Jofre Mateu Gonzalez has been ruled out after picking up a ligament injury. Fikru has not been scoring of late but he still is a huge threat with his physical presence. Luis Garcia will be back for today’s match after not featuring in Kolkata’s last match. “I will make no excuses for our form. We have been very very poor and I just want the team to go out and play for the fans tomorrow. It is our last home game so we would want to end it on a high. Arsenal star on the radar – Will Wenger leave him for an irresistible price?